A Tuesday night before the NHL trade deadline had the best of times and the worst of times for New York Islander and New York Rangers prospects. Before I forget; make sure you head over to the Blueshirt Bulletin website tomorrow for your draft day coverage and a huge announcement concerning this blog and yours truly. Jesse Graham (NYI 2012 6th) most likely won't be offered a NHL contract by the New York Islanders this spring so Graham has to do what is needed in order to attract interest from another NHL team or re-enter the NHL draft. As Graham and his Saginaw Spirit took the ice against the Sarnia Sting the Spirit were looking to lock up the 6th seed in the OHL's Western Conference playoffs. 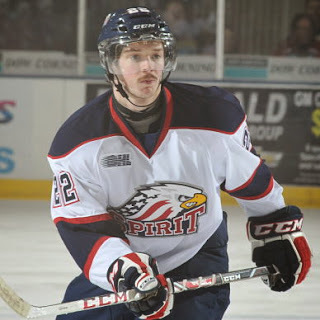 Graham earned the game's first star with a 4 assist evening to help the Spirit earn a 5-2 win over the Sting. Graham's first assist was a primary helper on Eric Locke's shorthanded goal at 6:43 in the 2nd period which tied the game at 1-1. Exactly one minute later, Graham set up Dylan Sadowy's goal which gave the Spirit a 2-1 lead. In the 3rd period with the Spirit up 3-2, Graham was credited with a secondary assist on Cody Payne's power play goal at 12:54 which made it a 4-2 game. Finally assist number 4 was just 41 seconds later when this time Graham got the primary assist on Cody Payne's 2nd power play goal which made it 5-2. For Graham, the 4 assist game tied a career high set earlier this season when he had a prior 4 assist game against Ottawa and was the 3rd time this season that Graham had a 4 point evening. Graham improves to 11-38-49 on the season. Adam Tambellini (NYR 2013 3rd) had a 2 assist night to help his Calgary Hitmen defeat Ryan Pulock's (NYI 2013 1st) Brandon Wheat Kings 5-1. Tambellini recorded primary assists on Calgary's first and fourth goals as the Hitmen scored 5 straight goals before the Wheat Kings got on the board with a goal in the last 90 seconds of the game to ruin the shutout. Tambellini improves to 16-17-33 in 25 games with the Hitmen who extended their unbeaten streak to 13 games (12-0-0-1) and opened a 2 point lead over the Edmonton Oil Kings in the race for the WHL's Eastern Conference title. Pulock was held scoreless as the Wheat Kings with 5 games left in the regular season find themselves 6 points behind Swift Current in the race for 6th place in the WHL's Eastern Conference while holding a 4 point lead over 8th seeded Red Deer and 9th seeded Prince Albert. Griffin Reinhart (NYI 2012 1st) and his Edmonton Oil Kings might regret losing to the Swift Current Broncos on Tuesday evening if they fail to repeat as WHL Eastern Conference champions. Up 3-1 midway in the 3rd period, Edmonton gave up 3 goals to lose to the Broncos 4-3. As already noted Calgary opened a 2 point lead in the standings because Edmonton gave up all 4 goals in the 3rd period as Edmonton's defense fell apart. Reinhart was scoreless and a -1 for the game. Mackenzie Skapski (NYR 2013 6th) dropped his 2nd straight game as his Kootenay Ice were shutout by the Red Deer Rebels 3-0. Skapski had a terrible first period giving up 3 goals while only facing 10 shots. Not a good outing for Skapski who was coming off a loss to Prince Albert. Skapski was much better over the 2nd and 3rd period stopping the 23 shots he faced. Still back to back losses to 2 of the lower ranked teams in the WHL's Eastern Conference are unacceptable at this time of the year. If he can't beat the 8th and 9th ranked teams then how is he going to win a playoff series against the 5th seeded team? If Skapski and his Ice teammates don't watch out Swift Current is going to sneak past them and then things get worse having to face 3rd ranked team which is going to be either Calgary or Edmonton.